Waterfall fun!. 5 bath cups make bath time fun!. 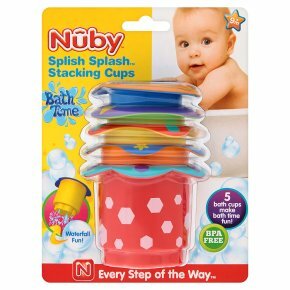 BPA free.The Nûby\ Splish Splash\ Bath Time Stacking Cups teach coordination and development. Stacking bath cups are a bath time classic and provide endless fun. Your baby can stack them together, put things inside, and watch the water drain from the bottom of the cup. Nûby\ has created another fun and educational item, designed with your baby in mind! This product exceeds all government safety regulations and standards. Warning: Always use this product with adult supervision. To avoid possible injury, do not let child walk or run with bath cups. Please retain these instructions for future reference.<br>Prevent drowning. Do not leave child unattended during bath.<br>Always keep child within adult's reach. Do not allow other children to substitute for an adult supervision. Always check water temperature before placing child in bath. Please retain these instructions for future reference.